Our health claims experience is looking pretty bleak right now. If we stay on this trend, we could be facing a 28% increase in 2014. That kind of news serves as a tripwire even if it wasn't deliberately set. Yes, I just finished reading the Heath brothers new book, Decisive. If you haven't read it, it's well worth your time. And, if you're wondering what a tripwire is, David Lee Roth explains it best, but in short, a tripwire ensures you are aware it's time to make a decision, that you don't miss a chance to choose because you've been lulled into autopilot. Another concept introduced in Decisive is bookending. Bookending helps us stretch our sense of what the future might bring, considering many possibilities both good and bad. So, if I look at our situation optimistically, I'd say we might get away with a 15% increase. Some plan design changes for 2014 like no pre-existing conditions, coverage of clinical trials, no limits on essential health benefits. UHC is suggesting groups in Maryland plan as follows. (This is a little different than what UHC is advising nationally according to this post.) The dynamics in the DC area tend to be a little different than the rest of the country. Employers provide richer benefits in our area and people have easy access to care. That makes 15% on the optimistic end and 28% on the other. Not pretty or sustainable either way. So, we'll be engaging our executive team to explore options. 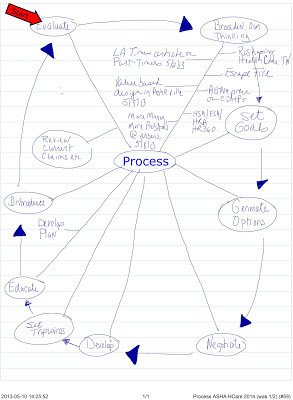 I mind mapped this process to guide us. Ultimately, that's the big lesson in Decisive -- you need a deliberate process to make good decisions.